This was one of my first ever Mac purchases, and it still continues to be one of my favourite Mac products, and favourite highlighters of all time. 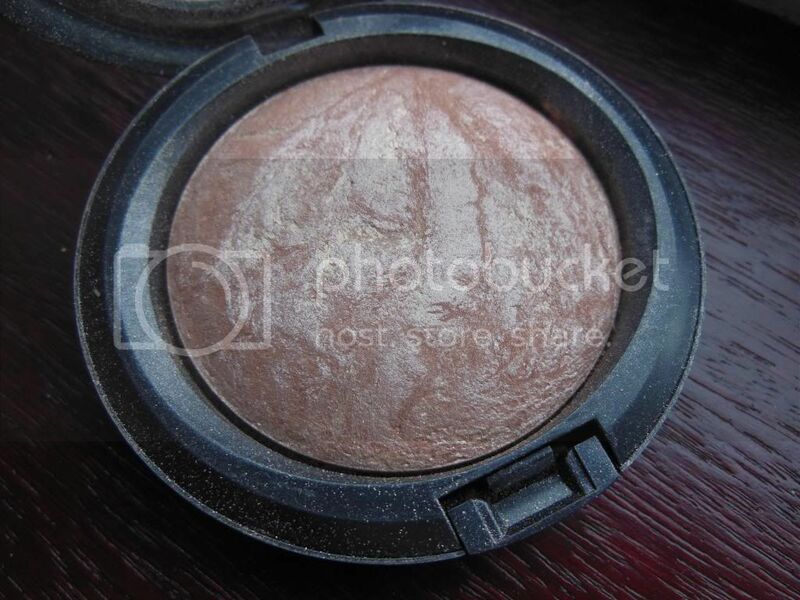 I mainly use this on nights out as a highlighter on top of my blush, as it tends to go with everything (my favourite combination is layered on top of Mac's 'Sunbasque' blush - stunning), but I've also been known to wear it throughout the day, applied lightly so that it just gives a subtle glow (like in the picture above). In the pan, as you can see from the first picture, it's absolutely wonderful; a swirling mixture of peach, bronze and gold. The look of the powder in it's packaging is enough to sell it to anyone I would think, it just looks amazing. When swatched (oops, I forgot to take a picture!) it is really highly pigmented and reflects the light beautifully. On the skin, you get a very similar effect. The powder is very buildable, so for a night out I tend to apply it a lot heavier than I would for daytime. When you look closely, you can see the small reflective bits of gold glitter, but on the skin it's not OTT (so don't worry you don't look like you've gone back to the 90's and applied glitter to your cheeks). It does however give off a lovely glow, especially in photos where it is picked up really well. As this is a Mac product, you would expect it to be quite pricey, which it is. It's £21.50, but you do get a large 10g worth of product, which I can definitely tell you lasts a very long time. A little goes a long way with this, so it's definitely worth the price. This is one of my fave highlighters! I love it!! ..and if you're ever passing through my blog Tor, do say hi!